Mumbai Mobile Creches (MMC) is the only non-profit in Mumbai running crèches city-wide for the children of migrant construction workers. These crèches or day care centers are run on the construction sites, and the area for each crèche is provided by the builders. MMC’s primary objective is to provide security, nutrition, healthcare and education to every child at each construction site. MMC requires a minimum of 20-25 children, in the age group 0 to 14 years, to start a crèche. Each crèche is well maintained with basic facilities: kitchen, clean washrooms, blackboard and other study materials. To promote Early Childhood Development, MMC works with other NGOs to train them to run comprehensive day care centers. MMC is actively involved in creating awareness of the rights of migrant children, and to do this it is working with several government departments like the Education Department; Public Health System; Labour Department and Women & Children’s Department. It has partnered with Integrated Child Development Services (ICDS), a national level program floated by the Women & Children’s Department, to ensure for the first time ever, that children of migrant workers receive preschool education and supplementary nutrition. Within the construction industry, MMC shares a good rapport with established real estate players like DB Realty, Lodha Group, Raheja Builders, Godrej Properties and others. Impressed by MMC’s work onsite, most builders now directly approach MMC to run crèches on their premises as soon as they decide to commence a new construction project. MMC has divided their beneficiaries in three categories and gives them different levels of care and support Besides elementary education, MMC has appointed doctors from the community to visit each center once every week for regular check-up of each child. MMC manages roughly 25-30 crèches each year across Mumbai, Thane and Navi Mumbai. Since 2006, MMC has run over 270 creches across these locations. In FY14, MMC managed 23 crèches and reached out to approximately 4,000 children across all centers. At present, it reaches out to over 1,100 children per day across all its centers. MMC’s comprehensive programs have helped several children cultivate a passion for learning, maintain good health and develop social skills. Besides catering directly to children, MMC conducts several training sessions on Early Childhood Development throughout the year for migrant construction workers and other NGOs. MMC earned a total income of Rs36mn in FY14 v/s Rs27mn in FY13. Domestic institutional donors, foreign donors, and interest income continued to remain major revenue contributors since FY10. The average contribution made by each of these sources during FY10-FY14 was 55%, 20% and 11% respectively. Interestingly, on an average, 48% of total institutional income between FY10-FY14 was received from the builders in whose sites crèches were set up and managed (Refer Fig. 2). 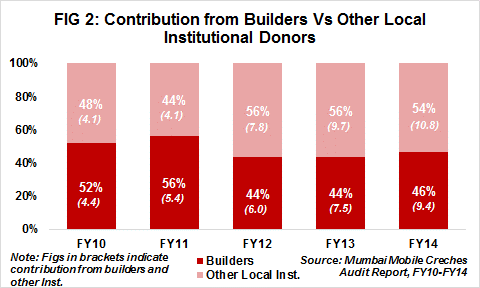 In FY14, 46% was received from builders. Some of the builders MMC has worked with include DB Realty, Godrej Properties, Raheja Builders, Lodha Group. MMC has also been receiving funds from the government to implement the ICDS program. This is to cover supplementary food and preschool costs for children. The contribution received in FY14 was only Rs0.8mn and has remained at this level since FY10. The amount received from the government is clearly not enough to meet MMC’s growing reach. MMC runs a low-cost operating cost model. This is because it doesn’t own any crèches. The premises are constructed by the respective builders and MMC is responsible only for managing the crèche. Since FY12, MMC has been consistently spending 90% of total expenses towards program activities. Rs29mn was spent directly on beneficiaries in FY14. The 90% spent on beneficiaries includes 5% or less on Program Staff Costs in last three years. This suggests that the large majority of expenses is spent to provide the children with food, education and health services; and on awareness building activities. MMC operates from their office in Colaba. It pays no rent for these premises as it is donated by the Taj Group. Overheads stood at just 3% in FY14 viz. in line with the average of 2.8% for past five years. Trust Corpus, during FY10-FY14 grew at a CAGR of 21%; suggesting donors’ confidence in MMC’s programs. Contribution received towards Trust Corpus was the highest in FY11 (of the five years). It jumped from Rs16mn to Rs23mn, i.e. 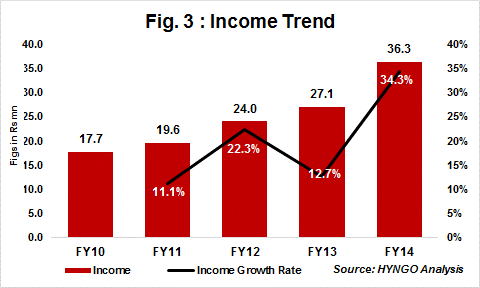 YoY increase of 47% in FY11. For the other years, YoY growth was between 11% and 16%. It must be noted that contribution towards corpus is made by both domestic as well as foreign donors. MMC posted a 5-year income CAGR of 20% for the period FY10-FY14. 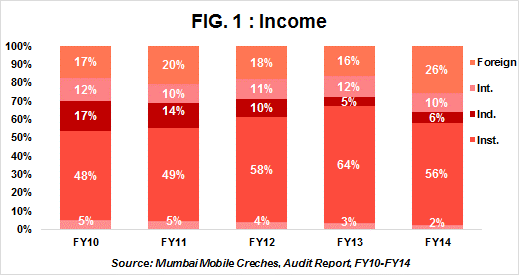 MMC recorded the highest YoY income growth rate of 34% in FY14 in the past five years. This was owing to a significant 111% YoY increase in income from foreign sources in FY14. Self Sufficiency Ratio (SSR) which measures an organization’s ability to meet operating expenses from its own income sources like donations from individuals, service charges and interest income was only 19% at the end of FY14. Theoretically, this suggests that MMC must consider generating higher levels of its own income to remain sustainable. It is inappropriate to expect a higher ratio of own income as in case of other own income generating non-profits running schools, hospitals, SHGs etc. MMC’s operating model doesn’t allow them to charge fees for its services for a fee, justifying the low SSR for MMC. It is impressive to note that MMC has over the years developed diversified external income sources, increasing the longevity of MMC. The organisation receives donations from numerous blue-chip Indian Corporates, Indian and Foreign Trusts and Foundations, Government Bodies and Individual Donors; most of these are committed donors. Sources we interacted with in the NGO shared that the attrition rate has remained at 0% in past five years. This indicates the healthy work culture at MMC. At present, there are 135 employees on MMC’s payroll. 90 of these manage the day care center and others are involved in administration work. MMC employs 13 female employees for every 1 male employee i.e. only 15 males on total staff strength of 135. Language Barrier. Research shows that most construction workers in Mumbai are migrants from 21 different states. It is thus difficult to communicate and convince parents to send their children to the crèche. It is even more challenging to engage with a child in the initial days. To overcome this, MMC conducts activity based sessions that would draw a child’s attention and gradually teaches them Hindi/Marathi/English depending on their grasping level. High school dropouts. Since these are children of migrant workers, there is very little chance that they will stay around in the same school until they complete their SSC. Studies show that the dropout ratio is as high as 79%. The Governing Board comprises of eight trustees, majority of whom have been associated with Mobile Crèches for over two decades. The concept of Mobile Crèches was originated in 1972 in Delhi. For easy administration, in 2006, Mobile Crèches was split in three entities viz., Mobile Creches (Delhi), Tara Mobile Pune and Mumbai Mobile Creches. All three have different legal identities and work independently. MMC’s CEO Ms. Vrishali Pispati is an ex-investment banker and is currently spearheading the operations at MMC. The Board meets five times in a year and the quorum set for Board meetings is six. None of the trustees on the Board of MMC are related to each other. The average age of trustees on the Board is little over 60 years. Staff meetings are held once every month. MMC is a lean, yet a structured organisation. MMC is empanelled with the National CSR Hub at Tata Institute of Social Science, an initiative of the Central Public Sector Enterprise (CPSE) under the Ministry of Heavy Industries and Public Enterprises, Government of India. It has received accreditation from Credibility Alliance (Desirable Norms) which is valid up to 2016.